With Fuzz home for the holidays, she has more time to eat breakfast. I don’t know if that means she will actually eat breakfast, but it doesn’t hurt to tempt her a bit with Sour Cream Bran Muffins. Since Epicurious billed this recipe as “The Rolls Royce of Bran Muffins” I figured I’d try it. Now I wish I’d made these sooner. I’m linking directly to the recipe, but I did make some minor changes (after picture). These are big, soft and extremely moist as opposed to dense and chewy. However, they’re not cupcake-ish whatsoever. They’re bran muffins with mass appeal. Good for house guests, children, special occassions. Not particularly healthful, but they do have fiber. Thanks so much for the comment and for reading the blog. I agree with you that these are good muffins. They’re kind of a “gateway” muffins to healthy-type muffins ;). I have been an admirer of your blog for some time now and I’m a ‘first time commenter, long time looker’ and I must say that most all your recipes I’ve tried (give or take a few) get rave reviews from my BF & co-workers. I was a little reluctant to make such a ‘healthy’ muffin but OMG its sooo good. I knew it was ‘bran’ so I was prepared for that taste but I was shocked that the ‘bran’ taste was just sooo flavorful!! I went with half wheat & half AP flour and followed your suggested tweaks and these muffins turned out soooo good! I agree with Epicurious that these are the ‘Rolls Royce’ of bran muffins. This recipe is a KEEPER! Readers: you’ve gotta make these! Thank you for the recipe! I made these today and they are wonderful. I did use the raisins (golden and more than 1/2 cup) and tossed in chopped walnuts. Very good recipe!!! Judy, sorry it took me so long to reply. I’m not sure, really. I don’t use a lot of oat bran. Carole, I think these are sort of healthy but not really….too much butter and sour cream. BUT they have fiber, which is good. Who said that healthy can’t taste good. Anna, do you think I could substitute oat bran for the miller’s bran in the muffins? Thank you. Great idea!! My kids love muffins. Your almond toffee recipe turned out GREAT!! Thank you! My daughter (who is very conscientious about her eating) is having a very difficult time staying out of it, as is my husband. My son hasn’t tried it yet. He’s not into nuts, but when he does try it, (and he will) he will love it too. The chocolate sundae cookies are finished as well. I played with the recipe. I used butter instead of shortening which I often do, and I added some almond extract which was a good addition. I also purposely underbaked them. We’ll see how they are tomorrow. Usually they’re even better the next day. 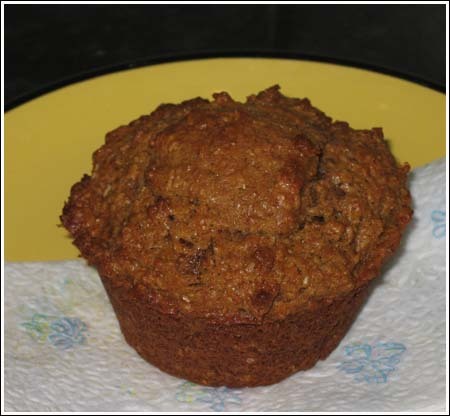 Mmm…always on the look-out for a new bran muffin recipe—thanks!